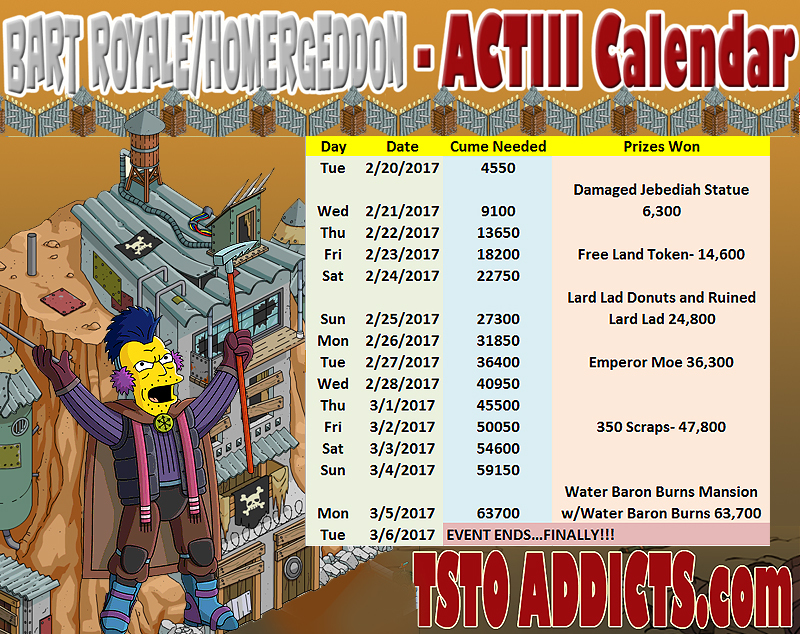 ← Bart Royale Act 3 is Live! Before we get to the numbers…I have to admit, that I don’t hate this update as much as many/most of you do! I know! Weird huh?? Somehow, with world events being what they are, building a Dystopian Corner in my Springfield just seems right. I’m putting mine right next to my slice of heaven (where Jesus hangs out), so when “the end” comes, I have a short walk to the promised land. The currency for Act III is (which if you can’t figure it out, is supposed to be a gas can). HERE ARE A COUPLE OF TIPS..
**If you are struggling to keep everyone doing what you think they are supposed to…don’t bother. When it says, “Destroy Ruffian Fort Defenses”…send ALL of your peeps to do it. And if it asks you to attack or fortify, do so on the fort that has the highest multiplier. It Does NOT matter if you have equal numbers of attackers and defenders. I almost always have my people attacking, so I can see the animation, unless there is as specific task to do otherwise. I only defend when forced to do so with a task. **Send your peeps to the fort with the highest % bonus. There is no reason to worry about balancing out the bonus…they all pay out the same. So use the one that is maxed out to 20%. **Just keep clearing everyone, every 4 hours…and putting them back to work…and you will be fine. Trust me. 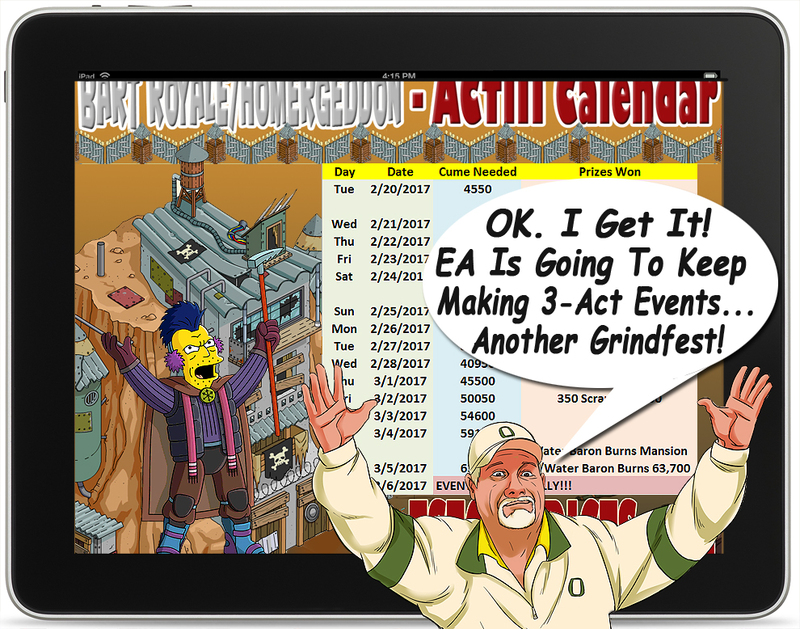 Like All of the TSTO 3-Act Events…Act III is pretty much just a grind-fest for some lackluster prizes. But, hey…it’s free…right? (as in don’t spend real money on this stuff, if you can be patient and donut farm, or just forget about it). Chances are, this event will go down in the “meh” column for most by the end of the year. At least, let’s hope so. I am personally looking forward to being done, so I can store the playground/forts, and just build a cool Dystopian corner with what’s left over. How are you doing? What do you think of the event so far? 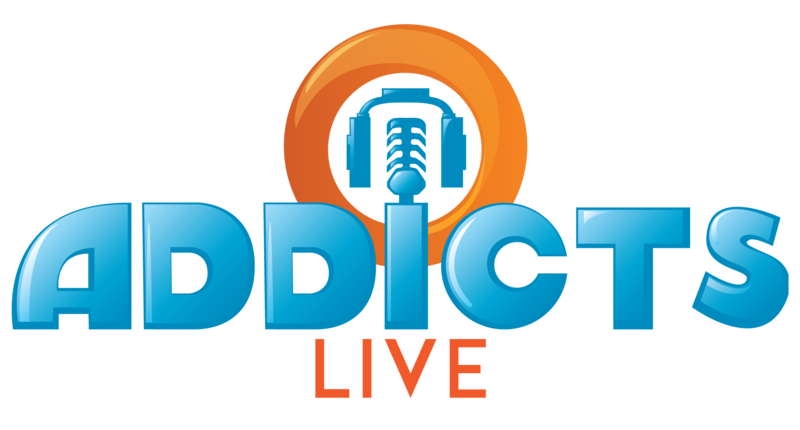 What is your favorite prize in this event? 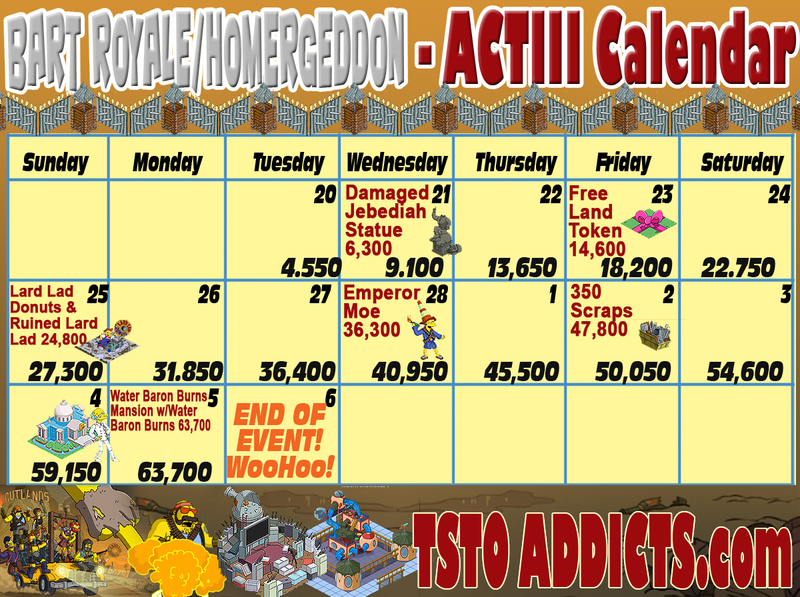 This entry was posted in Tapped Out and tagged Tapped Out Tips and Tricks, The Simpsons, The Simpsons Tapped Out, TSTO, TSTO Act III Calendar, TSTO Addicts, TSTO Bart Royale Event, TSTO Tips and Tricks, TSTO Water Baron Burns, Water Baron Burns. Bookmark the permalink. Looks like they added a day. It’s a recurring mistake in past calendars too. Putting a Tuesday prize on the Wednesday. I think Three acts are fine but the one thing that needs to change is skins should NEVER be the final prize. I think skins should maybe be act 1 though I assume adding a character as the final act 1 prize does help people get into an act. But for this event we had two acts where the big prizes were skins… Whats worse was the skins in act 2 don’t help at all with finishing the event. Now this event just going drag with no fun to be had. Sure everything is free and optional still would really like for events to be fun… It’s not fun after you’ve collected all the playable characters. Had anyone else noticed/have the same glitch that EA is working on the cheap side? As in they tell me I get collections and craftables for 30 action, but they pay out only the 29. I though I saw it happen in the previous acts, but just thought to check my counter and was able to verify. I love this event more then anything in my 5 years of playing. I wish it lasted longer then 3 acts! Not so much a grind this time. I already have lard lad donuts. So I’m sending people to regular tasks to earn money. Need to farm to get 300 donuts and I’ve been lazy lol. Me too… Way ahead… but I accidentally bought a freakin’ Funzo, just when I was going to buy the refrigeratorium. Hate Funzos. Staying up late to farm the donuts I need tonight. Just got Emperor Moe this morning. Didn’t even realize it till it came up to collect. Though balancing tasks and questlines is a challenge at times. 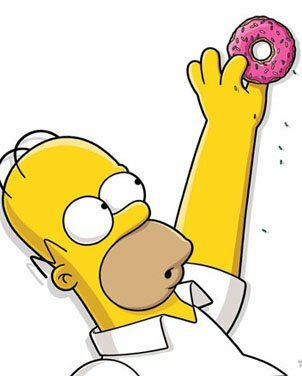 Who to send where and when because of Donut farming with KEMs and Monorail. But all in all it has been fun and not overly tasking to get through. Now I’m seeing the “defenses destroyed” at the ruffian fort not adding up to the number of assaulters sent also, but finally realized that’s not a glitch but a feature. Our mistake is thinking that number of assaulters = number of defenses destroyed. But not all assaults will be successful most of the time. So just as in those role playing games where teams meet up with monsters and the computer runs a program to decide who wins and who is damaged by how much – in this case, there is a program deciding how many defenses are actually destroyed. It’s probably rather random but also connected with how many you send to assault, just not in a one-to-one relationship. It might even take into account the strength of the people you send, if they’ve been assigned different strengths. Nelson just has to be more dangerous than Ralphie…. So there’s no problem with the EA counter at the fort, it just isn’t counting the number of assaulters to directly come up with that “defenses destroyed” number. There’s a randomness to it since all assaults would not be successful. Every report I’ve seen has indicated that the “defenses destroyed” is less than the number of assaulters, which is reasonable. I don’t mind three acts if it stays interesting. I was bored with this by the end of act 1. The prizes are as Boring as Stonecutter’s. Thus bumped Stonecutter’s into my second least favorite event. Equally boring prizes but with more boring gameplay. Even the doughnut stuff I have to force myself to buy. The 3 act thing is very annoying. 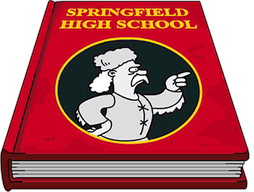 I for one like to have a bit of downtime between acts so i can get my Springfield in order and send sprinfielders on tasks so i can make some decent wedge (money). I am level 108 so i appreciate some who are much further on wont have that problem. but i feel i would be a lot further along in the game if these acts weren’t thrown in to slow me down to a crawl. This act was definitely too long and lackluster and it didn’t help that my update was soo late i didn’t get enough for Pyro. 2 acts or even just 1 acts would be appreciated. Picky picky picky. Just remember there’s no gun to your head forcing you to do the event…. I’ve opted out or just casually tapped without working on any of the prizes before. Or I stop doing some of the mini games for a while. I’ve even taking a break from recycling, but the pull of those frequent recycling donuts is getting impossible to resist. Plus I feel derelict in my civic duty. Also you can pay the employment office a commission and use it to speed up task assignments any time you want, if you want more cash or XP (for donut farming in my case) but aren’t in the mood to go through the whole list. You don’t have to assign tasks to everybody, either. It’s ok to just let them wander around without actually working. I got the Zombie Sandwich from the mystery box and realized it fits perfectly in the Outlands area. I put it near the Simpsons’ old house, which seems appropriate. So now zombies are stumbling around that area along with the ruffians, which seems to make sense. Also it’s easy to assign the zombies all at once. saw someone with emperor moe today. hacker, or are some people just that far ahead? Emperor Moe should be on Tuesday. I don’t mind 3 act events. But what I’d like to see is more jobs for more characters relating to the event. I feel like I have so many characters and would like to be able to use them. Even is the tasks or jobs aren’t earning event currency, I’d like more “stuff” to do. I do enjoy the events when they have mink games in between the event story line.